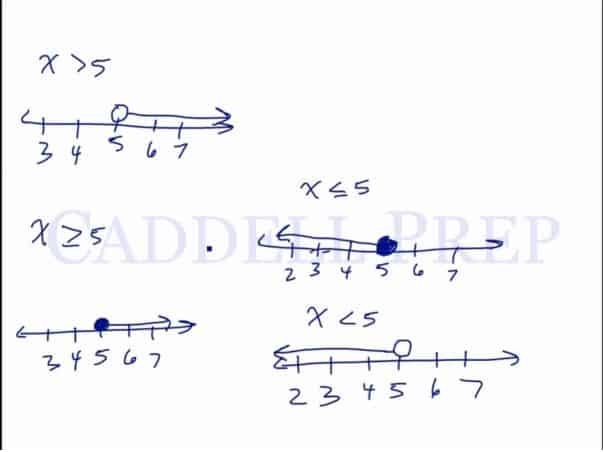 In this video, we will be learning how to graph inequalities without using the graphing calculator. Here, we include all numbers less than 5 (to the left), but do not shade the circle on 5 because it cannot equal 5. Here, we include all numbers greater than 5 (to the right), but do not shade the circle on 5 because it cannot equal 5. We include all numbers less than 5 (to the left) and also shade the circle on 5 because it can equal 5. Here, we include all numbers greater than 5 (to the right) and also shade the circle on 5 because it can equal 5. Let’s go over how to graph inequalities. First of all, what is inequality? is an equation because it is equal to a certain number. In inequality, it doesn’t exactly equal to. So, how do we graph this inequality? Let’s see how to graph the equation . Draw a number line. The point that has is our equation . Here, we have an infinite number of solutions. Because we can have any number that’s less than . So, are all less than . The equation has a point that represents the equals sign. In inequality, we will just encircle the endpoint. In this case, it’s . Then draw a line going to the left which represents the infinite numbers which are less than . First, let’s draw a number line. can be equal to so we can draw a point on it. Then let’s draw a line to the left which represents all numbers less than . Let’s encircle the number and draw a line to the right which represents all numbers greater than . Highlight the point in number and draw a line to the right which represents all numbers greater than . The line below the less or greater than sign means equal to. has the same meaning as . Think of the sign as a mouth. It’s going to eat whatever is bigger. Likewise we can write as . is also same as . And can also be written as .